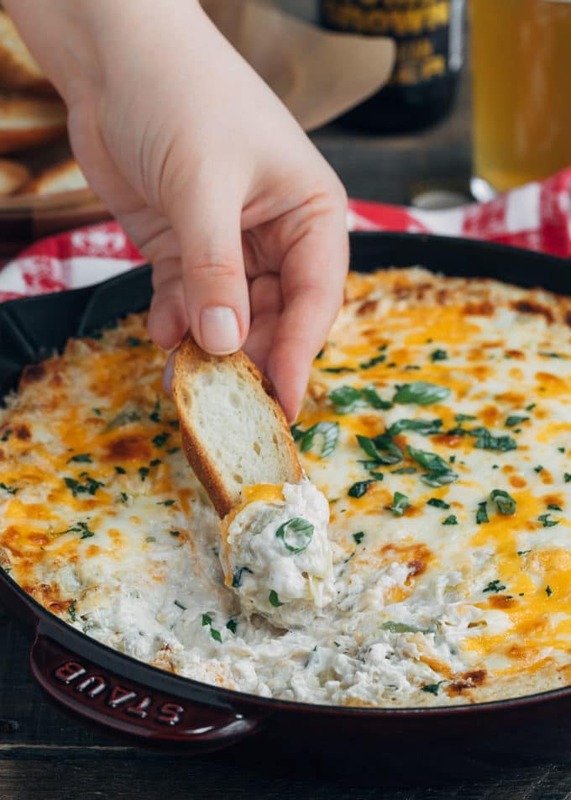 Creamy, cheesy, and loaded with a full pound of lump crab meat, this ultra-rich Crab and Artichoke Dip is a perfect appetizer for game day parties and year-round entertaining! 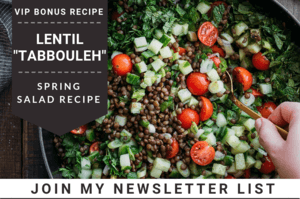 Visiting from Pinterest? This post was originally published in 2016 and updated in 2019. Crab and Artichoke Dip is one of my favorite restaurant appetizers. I especially like making it at home where I’m able to control the quality of ingredients and quantity of crab (no “fillers” here!). 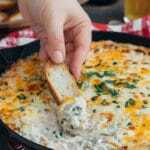 When I was developing this recipe, I turned to inspiration from two of my favorite dip recipes: Spinach and Artichoke Dip and Hot Crab Salsa Dip. I used the base from my spinach dip, adding sour cream for extra creaminess. 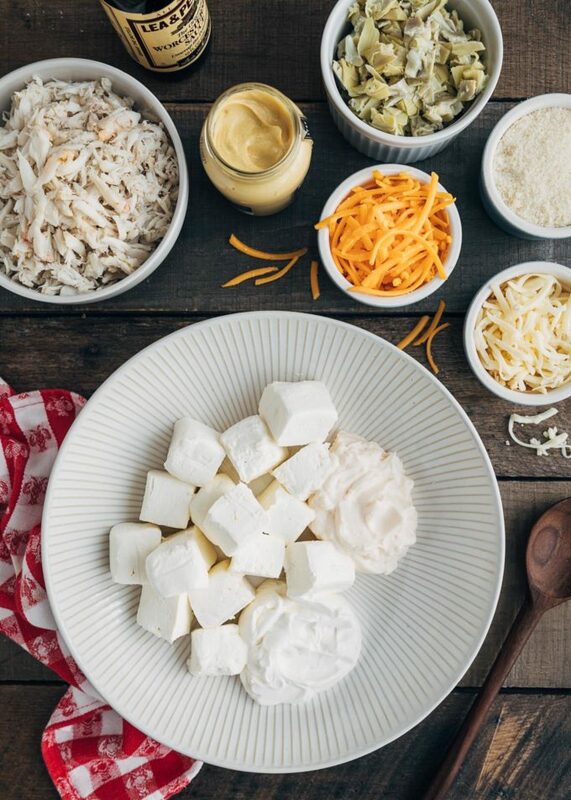 Like some of my favorite restaurant dips, I also swapped out the Italian 4-cheese shred for a blend of Cheddar and Monterey Jack, and paired the delicate crab with classic seasonings. 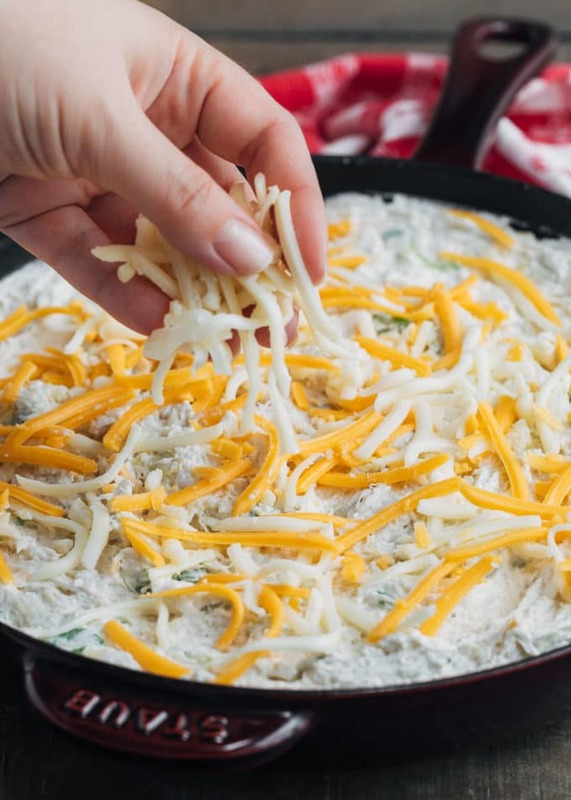 The first time I served this dip (a pre-blizzard batch during a football game), my friends were pretty much silent when they dug in. I’ve come to realize that this either means they’re indifferent about the recipe and it’s time to head back to the drawing board, or they’re totally and happily engrossed. Ingredient Quality: In any recipe, but especially in a dip like this, the quality of each component will determine the quality of the final product. Use the best ingredients you can, from the crab (more on choosing a grade, below) to the cheeses and the artichoke hearts. Shred your own cheese: Pre-shredded cheeses are usually tossed with starches to prevent clumping in the bag. This can cause a gritty texture in a creamy dip like this. Buy blocks of cheese and grate them yourself, either using a box grater, or with the shredding disk on your food processor. Drain any wet ingredients well. Whether you’re using canned or frozen artichoke hearts, it’s best to place them in a strainer and press out any excess liquid. You’ll be surprised by how much they release. It’s better to have that liquid go in the sink than watering down the dip! You’ll also want to make sure your crab is well-drained, especially if using pasteurized. Season to taste and customize.Since the salt content in cheeses can vary by brand, I’ve left the salt quantities open-ended for you to add to your personal preferences. Remember that crab itself is a delicate flavor, and while you don’t want to overpower it, you will need to give it some seasoning when it’s mixed with the dip’s rich, creamy components. This kind of dip is very adaptable to your personal preferences, and I’ve added customization notes in the recipe card. Like it spicy? Add more hot sauce or substitute pepper jack cheese. Love Old Bay seasoning with crab? It’s great in this dip, too! 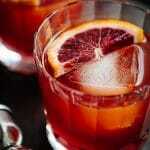 Take the base recipe and tweak it to the flavors you and your guests like best. What Grade of Crab Should I Buy? I like to use lump crabmeat in this recipe, which is made of broken pieces of the “jumbo lump” and “special” grades of crabmeat. Honestly, since you’re stirring the crab into the dip base and breaking it up, it isn’t necessary to splurge on the much more expensive jumbo lump here. 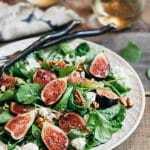 You can substitute the special grade of crabmeat in this recipe if you’re unable to source lump. Claw grade is also readily available, but bear in mind that it’s a darker meat and has a more prominent “crabby” flavor. It isn’t my favorite for this recipe. Want to read more about crabmeat grades? Check out Understanding Crab Meat from Philips Foods. Can I Use Canned Crabmeat? I like to use fresh crabmeat whenever I can, but pasteurized also works well here. I prefer the refrigerated containers to shelf-stable canned crabmeat, which can vary quite a bit in terms of texture and flavor. 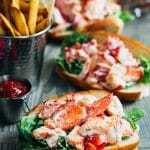 You’ll find pasteurized crabmeat in the refrigerated section of the seafood department at your grocery store, and often, displayed on ice. Don’t Forget to Remove the Cartilage! Part of the reason I prefer grades of crabmeat with larger pieces, like lump, is that it’s much easier to feel and remove the cartilage. A mouthful of cartilage in a creamy dip like this can really ruin the experience. With any crabmeat you use, pick through it thoroughly to remove any stray cartilage before folding it into your dip. Your guests will thank you! It’s important to let this dip rest a few minutes before serving. When it first comes out of the oven, the dip is very creamy. Letting it sit for about 5 minutes for the texture and flavors to settle is essential. The dip will thicken as it starts to cool. Personally, I like it best when it’s warm but not piping hot. I most often serve this dip with crostini or slices of French bread. It’s also great with crackers, lightly-salted tortilla chips, crudities (or just a spoon…but I swear, I would know nothing about that!). 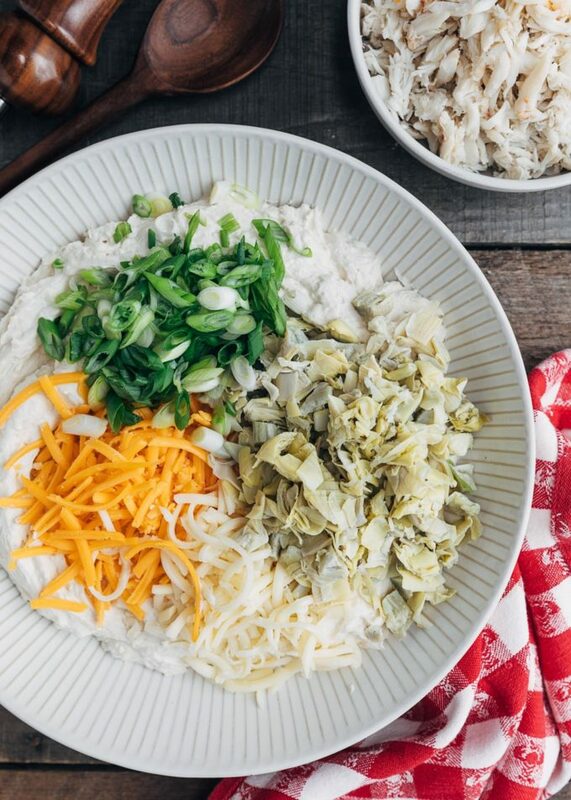 This Crab and Artichoke Dip has become a staple on my Game Day menu and for casual entertaining. 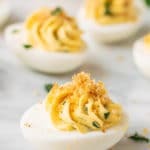 The recipe does make a large batch for a crowd, but you can easily halve it for a smaller group. Leftovers? I’ve only had them twice when there was just so much other food at the party that it was impossible to finish the dip. Leftover dip keeps well refrigerated, in an airtight container, for about 3 days. Need more ideas for your Big Game menus? Check out our Game Day collection! 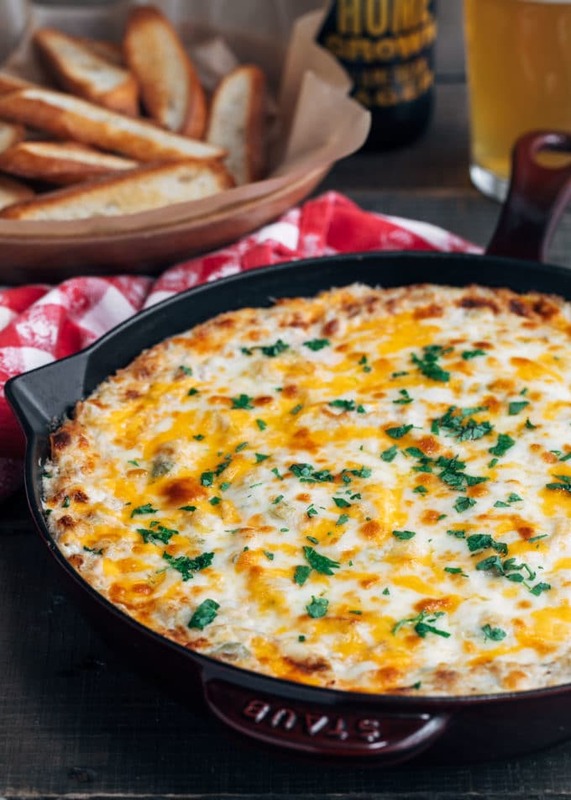 This creamy, cheesy, ultra-rich Crab and Artichoke Dip is sure to be a crowd-pleaser. To serve a smaller group, the recipe is easily halved. See the recipe notes for customization and serving alternatives. 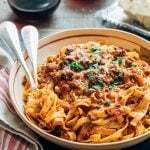 In a large bowl with a hand mixer, or in the bowl of a stand mixer with the paddle attachment, beat together cream cheese, mayonnaise, sour cream, mustard, Worcestershire sauce, garlic, a few dashes of hot sauce (if using), and Parmigiano Reggiano. Using a spoon or spatula, 1/2 cup Monterey Jack, 1/2 cup cheddar, and scallions, until combined. Fold in artichoke hearts and crabmeat. (Crab will break up as it's folded; I like to try to leave a few larger chunks in the dip, where possible.) Season with salt, pepper, and extra hot sauce (if using), to taste. Transfer dip to prepared pan. Toss together remaining 1/4 cup Monterey Jack and 1/4 cup cheddar (or more if you like a cheesier top) and sprinkle over the dip. 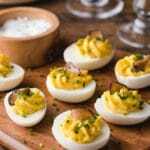 Place on a baking sheet and bake until dip is hot and bubbly, 25-30 minutes. If desired, you can place the dip under the broiler for a minute or two to brown the cheese, watching it closely so it doesn't burn. Sprinkle with fresh parsley and scallions to garnish, if desired. Let the dip stand 5-10 minutes before serving it warm with sliced baguette, crackers, crostini, tortilla chips, or crudités. The dip will thicken as it cools. * We like our crab dip on the creamier side, so I use 1/2 cup of sour cream. If you prefer a slightly thicker-textured dip, reduce the sour cream to 1/4 cup. Keep in mind that the dip thickens as it cools. For a spicy twist, substitute pepper jack cheese for the Monterey jack and omit the hot sauce or adjust it to taste. 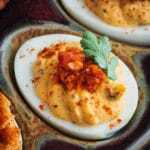 This dip is also delicious with Old Bay Seasoning. Start with 1/4 teaspoon when you season the dip and add more to taste. I often divide the dip between 4, 6-inch round gratins instead of baking in one large pan. I like to do this when I'm entertaining for a long afternoon (such as a game day party) and want to bake fresh dip at regular intervals. 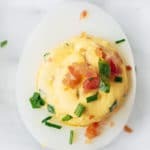 I keep the smaller dishes in the refrigerator until ready to bake, place them on baking sheets, and check the dip after 20-25 minutes in the oven. THE BEST. 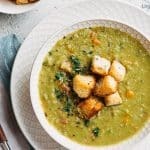 When my husband wanted to make this I looked at the ingredients list and almost fell over. Seemed so complicated. But it was not and even if it were, it would have all been worth it. This is the very best crab and artichoke dip I’ve ever had. We went light on the mayo and did a little more sour cream. We went heavier on the cheeses (just because my husband has a heavy grating hand). Not greasy, like SO MANY artichoke/ artichoke and crab dips are. This is now going on entertainment rotation. And Sunday football afternoon app rotation! Christina, your comment made my day! 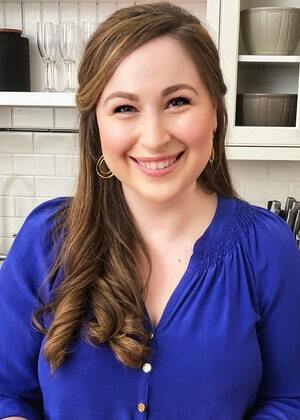 I’m so glad to know that you and your husband enjoyed one of our favorite dips so much. It’s a nice sized ingredient list, but once you get it all in the bowl, making it goes quickly :) A little extra cheese never hurt! Enjoy!! We had no leftovers of this dip after the Super Bowl. Fantastic recipe. I used a little extra hot sauce for my spicy food loving family. Will make again. We’re eating this right now waiting for the game to start and I don’t think the pan will make it past the first quarter. 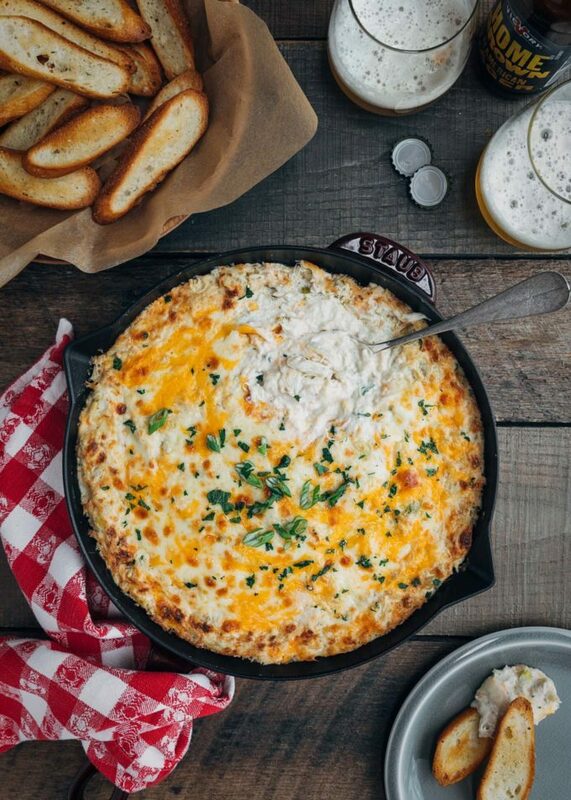 Delicious crab dip! Everyone is asking for the recipe. 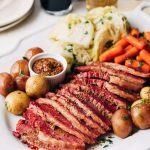 Your food pictures are gorgeous and look so delicious! I love artichoke dips! And great tip about dividing between smaller dishes, thanks!